Key Dreams had good luck with eels! Now it’s official! Rockfish pushing to over 50-pounds finally hit the scales this week. And as the water temperatures continue to drop, this action should only improve. The excitement started last week when breaks in the wind allowed anglers to sample the water, finding nice stripers to over 40-pounds. The biggest striped bass are coming from north of the 4th island at the CBBT, where anglers are catching nice fish during both daytime and night time hours. Folks are scoring with the nicer class of fish via several methods, including casting and trolling under working birds, drifting with eels off Plantation Light along the Eastern Shore, wire lining along the Bridge Tunnel structure and the 3rd and 4th islands, and dunking eels along the pilings north of the 4th island. School-sized fish are also available to casters working around the structure and pilings of most of the lower Bay crossings, with the first island of the CBBT and the nearby small boat channel, providing good action lately. Folks working the Monitor Merrimac Bridge-Tunnel are also still finding some decent schoolie action casting grubs and shads along the light lines and pilings. Surf casters are still faring well from the shorelines within Lynnhaven Inlet near the Lesner and Great Neck Road Bridges. More boats are beginning to report bait and pods of working birds along the Virginia Beach ocean front, where trollers are starting to pick up scattered fish pushing to around 40-inches. The folks at Ocean’s East 2 report that the speckled trout action slowed a little within the inlets this week, but anglers are still finding some good luck with the smaller fish, and within the Elizabeth River. Captain David Hester of Fishy Business Charters reports that although the action can still be hit and miss, some nice fish to over 8-pounds were landed this week within the River, the Cove, and the Hot Ditch. Mirrolures are the lure of choice, but those trying live bait are also scoring with some big fish lately. Anglers are also still finding good action with nice puppy drum to over 30-inches using both cut bait and lures. One boat fishing in Rudee Inlet boated over 20 pups using cut bait this week, with a few surprise gray trout to make things interesting. Another surprise catch made the day for an unsuspecting kayaker fishing in Rudee Inlet, as well as a tog angler fishing at the CBBT this week. Both anglers found similar fates when each lucked into nice late season black drum by mistake. Tautog are still making a good showing for those fishing crab and clams on most any lower Bay structure. All four islands of the CBBT, as well as lower Bay wrecks are productive lately. The deeper water wrecks are also producing very good results, with some boats hooking dozens of fish averaging around 5 to 8-pounds. Jumbo sea bass are also available on the ocean wrecks, along with chopper bluefish. Big bluefish are also moving closer to shore, where anglers are encountering fish from 12 to 20 miles from the beach. Flounder are active on deeper water structures, with some flatfish to over 8-pounds coming from the Triangle wrecks on a recent headboat trip out of The Fishing Center this week. Triggerfish are also a possibility on these same wrecks. Wreck fishing is good right now. Nice seabass are hitting most anything, while respectable flounder are taking drifted baits. Captain Steve Wray put his crew onboard the Ocean Pearl on a limit of nice seabass while fishing near the Triangle wrecks this week. Chopper bluefish are also still prowling around most local wrecks. Bluefin tuna have been sighted frequenting the same areas holding bluefish for a few weeks, but the first catches of school sized bluefin were reported this week. Although evading most, some boats lucked into a few tuna ranging between 70 and 80-pounds, hitting ballyhoo on trolled blue and white Islanders. If targeting these big fish, be prepared with the appropriate class of heavy gear and tackle. Deep droppers are finding good numbers of big blueline tilefish, some golden tilefish, lots of blackbellied rosefish, and nice seabass. Swordfish are still a possibility for overnight trips. The recent break in the weather gave boats the opportunity to get out and test the waters, with some very good reports as a result. The top news is that anglers were able to verify that the bigger rockfish moved into the lower Bay, with catches to over 40-pounds reported this week. So now the chase is on! Anglers are beginning to hook nice fish while dunking live eels at various depths from the 4th island to the high rise section of the Bay Bridge Tunnel, especially at dusk and at night. A few nice fish are also coming from drifting eels along the channel edges and shoals off the Eastern Shore. Drifting with eels is an effective technique resulting in fewer, but a larger class of fish. 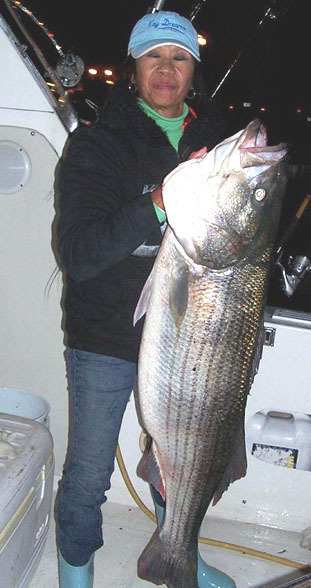 Expect the really big rockfish pushing over 50-pounds to debut soon. Anglers are also still scoring with striped bass of all sizes all over the lower Bay. School-sized fish are available to casters working bridge pilings, while boats using live bait and wire lining over the tubes of the Bay Bridge Tunnel, are finding a nicer class of fish. The folks at Ocean’s East 2 report that anglers are also cleaning up with 24 to 28-inch rockfish while casting poppers at the islands of the CBBT at daybreak lately. Folks trolling with Stretch swimming lures are finding some decent fish near the 2nd and 3rd islands. Skinny water anglers are still finding 22 to 26-inch fish within the local inlets on both lures and cut bait. Folks casting from the shore near the Lesner Bridge are finding some fish ranging to near 30-inches this week. Schools of fish in open water can provide good action for both casters and trollers, especially under beehives of birds. Some larger fish pushing over 40-inches are now coming from some of these schools. Speckled trout anglers continue to experience excellent fishing. Rudee Inlet, Lynnhaven River, and Little Creek Inlet are still showing an upswing in the frequency of bigger fish, with anglers reporting scattered specks up to 5-pounds mixed in with the smaller fish. The Elizabeth River is still providing catches of the bigger specks, where several citation sized fish, mostly ranging to around 24-inches, were hooked this week on Mirrolures, Bass Assassins, and Storm lures. The fish seem to be holding in the deeper water within the River, with no action reported from the Cove or Hot Ditch areas as of yet. Decent sized puppy drum are also providing some good action within Rudee Inlet this week, with some anglers reporting catches of fish to 30-inches on cut bait. Many fish are also taking the lures intended for trout within the inlets and the Elizabeth River. Tautog are biting all over the lower Bay and on some coastal wrecks. Any available structure along the CBBT is producing limits of quality fish, with a few topping 10-pounds this week. Green crabs are working well, with clams a good back up. Although an upcoming break in the weather shows promise, the primary driving force on the fishing scene lately has been the relentless weather. Therefore many are resorting to inshore fishing itineraries, and with the ongoing speckled trout run, not many are complaining. The speckled trout are still very active in most of the shallows of the southern section of the lower Bay, as well as the surf lines. Surf anglers are pulling keeper fish from the wash near the Sandbridge pier using grubs and cut bait. Most of the larger fish are still coming from the Elizabeth River. Rudee, Little Creek, and Lynnhaven Inlets are also giving up some respectable fish lately. In the Inlets, anglers continue to report dozens of smallish fish, with scattered keepers ranging up to around 22-inches, with Mirrolures still working well. The Elizabeth River trout experts convey that those searching out the bait are finding fish ranging between 3 and 8-pounds by casting swimming lures and jerk baits, as well as trolling along ledges. Scattered puppy drum are also still active in these same areas, with Gulp swimming mullets working well. Everyone is watching the striper scene. Although the really big fish are still to the North, anglers are enjoying some decent sized fish mixed in with the schoolies. The school-sized fish are available most everywhere in lower Bay waters, with the outgoing tide providing the best luck. Plenty of school sized fish are hitting at the Hampton Roads Bridge Tunnel and the Monitor Merrimack Memorial Bridge Tunnel. Casters working the pilings near the 3rd and 4th island tubes at the CBBT, especially at first light, are hooking dozens of fish to around 28-inches on Wind Cheaters and Storm Lures. Boats wire-lining and live baiting over the tubes are finding a slightly larger class of fish ranging to around 34-inches. Shore casters are also hooking some nice rockfish ranging to 30-inches under the Lesner Bridge. The first reports of striped bass caught off Cape Charles debuted this week, when boats hooked few fish up to around 38-pounds while drifting with eels. The Bay water tautog action continues to sizzle. Anglers are enticing limits of keeper fish from lower bay wrecks and bridge structure with blue crabs, green crabs, and clams. Many fish are ranging from around 4 to 7-pounds. Tautog on the offshore wrecks are also becoming more active. Boats are waiting for waters to readjust before placing too much emphasis on flounder fishing in Bay waters, so the reports are dismal. But good hauls of flatfish are coming from offshore structures, with the Triangle Wrecks area a top producer this week. Nice seabass are also responding on these same offshore structures, with a few pushing to over 5-pounds recently. Chopper bluefish are also still available near these offshore structures. Bluefin tuna could also make a showing, but no confirmed sightings or hookups have materialized as of yet.